For her project as Portsmouth Poet Laureate, 2007-2009, Elizabeth Knies took to heart the advice of former laureate Robert Dunn to “do something you’d love to do” and came up with an idea that expresses her belief that poetry can bring joy where one might least expect to find it. She borrowed the title Surprised by Joy from C.S. Lewis’s autobiography of his early years. Lewis had taken it from a Wordsworth sonnet written after his daughter died in 1812 at the age of four. The coincidence of Lewis’s use of the word ‘joy’ for his autobiography, written before he met the American writer, Joy Gresham, who later became his wife, captured Liz’s imagination years ago. Their unusual love story was portrayed in the play, “Shadowlands,” and in the film of the same name that starred Debra Winger and Anthony Hopkins. After Joy’s death from cancer, Lewis wrote A Grief Observed, which has become a classic. In early 2002, Liz lost her husband to cancer and was helped by a bereavement program at Seacoast Hospice. In the year following her husband’s death, she wrote deeply personal poems about the experience that she published as a chapbook, Absent from Felicity, for friends and family. 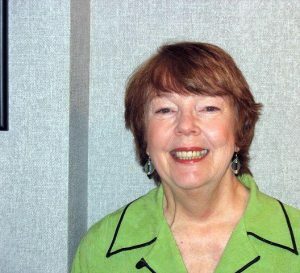 Her own experience of writing through grief led her to seek out Elaine Wiesman, Bereavement Program Manager of Seacoast Hospice, to ask if Seacoast Hospice would be interested in a grief support group for people who wanted to express their grief in writing. The idea was met with enthusiasm, and she and Wiesman worked together to design materials for a six-week support group that met in January-February of 2008 and will serve as a model for future sessions. For the second part of the project, Knies saw the potential of taking poetry into retirement homes as a way of bringing poetry alive to a population that might be limited in their ability to get out to events in the community. She enlisted a group of talented poets and actors (Bill Burtis, Gerry Duffy, Roland Goodbody, Anne Rehner, and Pat Spalding) to collaborate with her in selecting poems that trace the arc of the journey through life from childhood to maturity. Poems by Shakespeare, Yeats, Whitman, Housman, Frost, and Roethke are paired with humorous work by Judith Viorst, Ogden Nash and Lewis Carroll, and with newer work by Wendy Cope, Alice Oswald and Joyce Sutphen. Cellist Kristen Miller worked with the readers to choose music ranging from Bach to three of her original compositions to compliment the readings. The program was presented at five seacoast retirement homes: Edgewood Centre in Portsmouth; Langdon Place of Dover; Webster at Rye; The Cottage (Portsmouth Public Housing Authority); and the Inn at Spruce Woods in Durham. 10/26/08, 2 p.m.: Portsmouth Public Library (Portsmouth) – OPEN TO THE PUBLIC!